Follow Your Heart has been in the vegan cheese-making game for a long time. In my early vegan days, if you wanted vegan cheese it was either Follow Your Heart or Veganrella. My friends and I would get blocks of the Follow Your Heart mozzarella for pizzas, and I even convinced the cafe I worked at to order some so that we could offer more vegan options. It wasn’t really mozz-like, but it melted and had a semi-cheesy flavor. That was enough to satisfy me, but unfortunately many of my vegan friends from back then have caved in to their dairy cheese cravings. That’s one reason that I’m so excited for all of these new vegan cheeses to come out. I’ve watched so many vegans (ethical vegans, too!) turn their backs on the cause because they wanted pizza. Some of them would even joke, “I’m a pizza vegan.” Of course, pizza was a gateway for ice cream, eggs, and other animal products, so it didn’t always stop at pizza. With all of these new vegan cheeses getting wider distribution and creating such competition for dairy cheese, I think that a lot less people are going to go back to “pizza vegan”. This provolone cheese is off the hook amazing. The taste and texture, like the chao cheese, were a lot like I remember cheese tasting. It’s rich with the intense umami flavor that provolone is known for and has nice body. 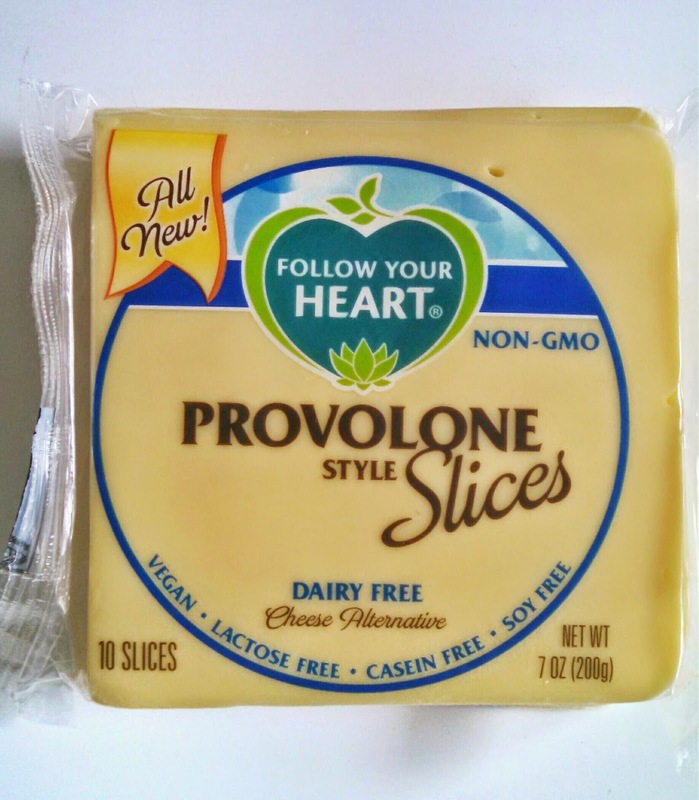 Comparing basic qualities of the Follow Your Heart provolone with Field Roast chao cheese, I’d say I prefer the chao. They are both a huge step forward in the evolution of vegan cheese, though, so my preference may not be yours! I had it first unmelted in a wrap with cucumber, red pepper, parsley, and a thin layer of hummus. It was something that I’d imagine getting at a deli or cafe grab-n-go case. It wasn’t necessarily anything special, but it was very satisfying. Next, I tried it on a brown rice wrap. I melted it with some wilted spinach and folded the wrap in half. 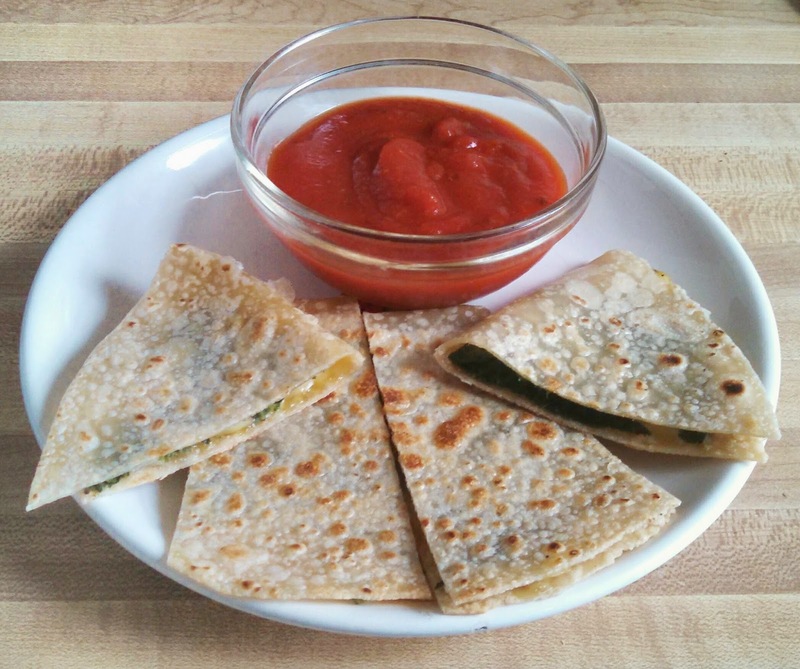 I then cut it like a quesadilla and served it with marinara sauce on the side. This was super good. I liked it so much that I had it again the next night. My partner tried the last few pieces in a similar way. 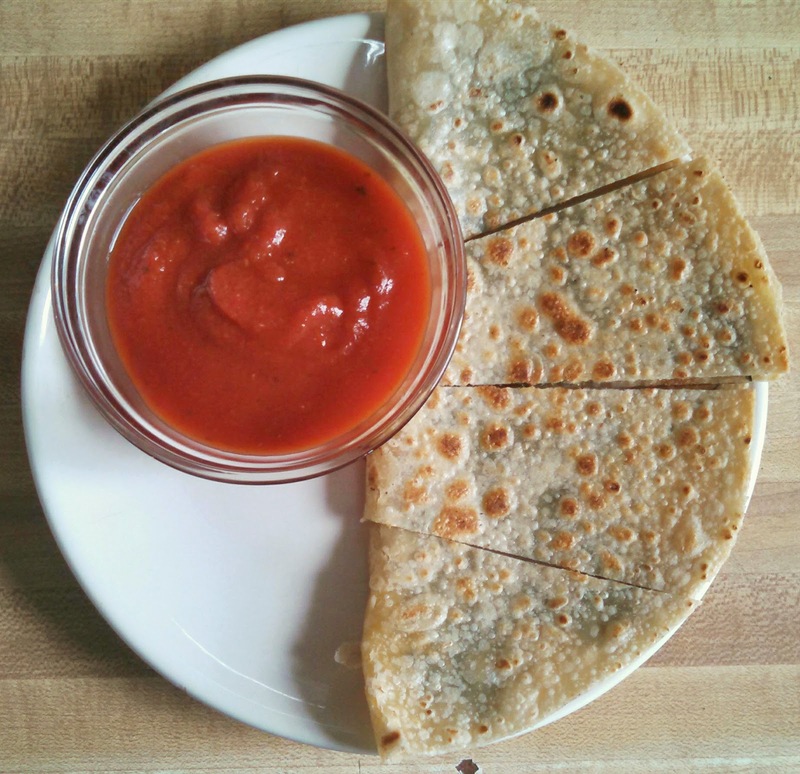 He made a quesadilla with some leftover mexican rice and bean mixture and hot sauce. He really loved it, too. He said that it wasn’t quite as dairy-like as the chao which was good for him. The chao tasted so much like dairy that he started getting a queasy mind-body reaction from the psychological confusion. My dad had this on a vegan burger. When I asked him how it was compared to dairy provolone, he said, “It’s on par or better!”. He’s always looking for ways to cut down on his animal food consumption, and these new vegan cheeses are exciting him. Sometimes he likes cheese on his veggie burgers, and now he has some really great non-dairy options to choose from! I’m throwing up a virtual high five to Follow Your Heart for reinventing their vegan cheeses so successfully!